Father’s Day is special for every dad. But some have more reason to be grateful than others. Summerlin-area resident Peter Kohler recalled the day when his wife, Karrie, stepped out of their bathroom, beaming. She was holding a pregnancy stick. They were going to be parents. Four years later, they waited for results from their daughter’s MRI to find out the mysterious cause of her reccuring headaches. Father’s Day is special for every dad. But some have more reason to be grateful than others. 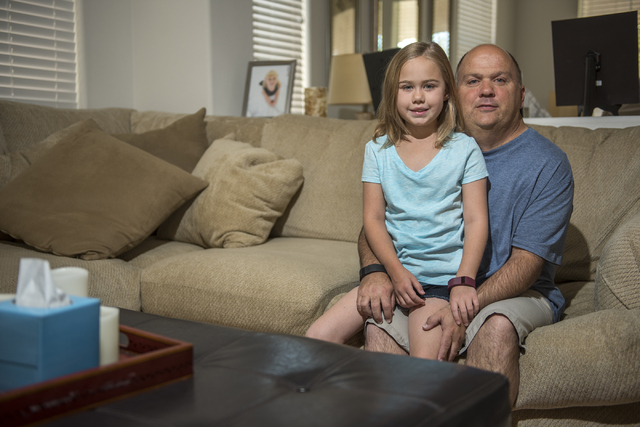 Summerlin-area resident Peter Kohler recalled the day eight years ago when his wife, Karrie, stepped out of their bathroom, beaming. She was holding a pregnancy stick. They were going to be parents. Nine months later, he was holding his only child, Alexa, and the reality of being a father hit him. He rocked Alexa to sleep, held her on his lap and read stories to her. He’d lie on the floor with her on his chest. They listened to music — “anything Disney” — and when Alexa learned to walk, he and Karrie recorded her first steps. 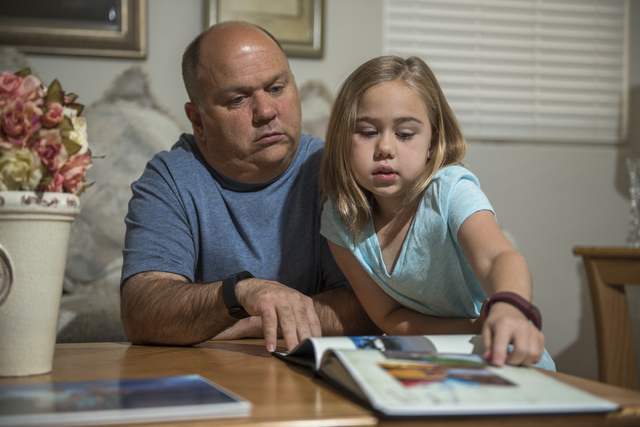 Then, when she was 4, Alexa began complaining of headaches — not just one or two but as many as three a week. She also had stomachaches. They took her to their pediatrician and then to an allergy specialist. Alexa had her tonsils removed. Nothing helped. They took her to Summerlin Hospital for an MRI. They went to the doctor’s office a few days later for the results. Alexa had medulloblastoma, or brain cancer. Medulloblastoma is a fast-growing, high-grade tumor. It is relatively rare, according to the American Brain Tumor Association, accounting for fewer than 2 percent of all primary brain tumors and 18 percent of all pediatric brain tumors. After the initial shock, the Kohlers rallied themselves and looked for the best doctors in and out of state. They ended up at Mattel Children’s Hospital UCLA in Los Angeles. There, Alexa had surgery to remove the tumor, which was near her spinal cord. That was followed by months of chemotherapy, which made her weak and sick and lose her hair. “But she was a real trooper,” Peter said. Karrie stayed in Southern California for the year while Alexa was in the hospital while Peter resumed his work in Las Vegas for the Regional Transportation Commission of Southern Nevada. Peter worked 10-hour shifts so he had three days off and shot down to Southern California on weekends to see his girls. But there, even hugs had barriers. He and his wife often had to wear hospital hats, mouthguards and gowns as Alexa’s white blood cell count plummeted. Now 8, she recalled seeing her parents entering her hospital room that first time in their gear. The treatments came with their own realities. Alexa’s motor skills were diminished after the surgery, and she needed a wheelchair and physical therapy to learn to walk again. Her right eye was affected by the chemo, and she had to have corrective surgery. Alexa underwent two stem cell transplants. She was eventually released to come home, but follow-up tests are still scheduled every three months. She wasn’t out of the woods yet. But then, six months ago, came the day that one of her regular MRIs showed no trace of abnormality. Last October, the family was sent to Hawaii, compliments of the Make-A-Wish Foundation, which provides vacations for families facing serious childhood illnesses. “That was the best thing that happened to us in three years,” Peter said. The nonprofit said it was happy to help the family after its long struggle. She said that granting wishes provides a welcomed break from the parents’ reality of paying medical bills, dealing with insurance companies and shuttling between doctor’s appointments. The family stayed at Aulani, A Disney Resort & Spa, at the Ko Olina Resort & Marina in Kapolei on the island of Oahu. There, Alexa met Disney characters and enjoyed the water park daily during their week’s stay. “She’d be up at 7 o’clock with her swimsuit on and go, ‘OK, I’m ready,’ ” Peter said. Alexa went on a treasure hunt, made goop in a hands-on science center, snorkeled and went to a luau. She even got to swim with dolphins. She said the Lazy River was her favorite part. The Kohlers said the Make-A-Wish trip was just what they needed.